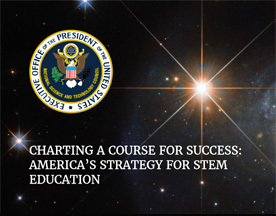 “Charting a Course for Success: America’s Strategy for STEM Education” is a report issued by the Committee on STEM Education of the National Science & Technology Council. Its purpose is to offer a federal strategy based on a vision for a future where all Americans will have lifelong access to high-quality STEM education and the nation will be the global leader in STEM literacy, innovation and employment. The Federal Government has a key role to play in furthering STEM education by working in partnership with stakeholders at all levels and seeking to remove barriers to participation in STEM careers, especially for women and other underrepresented groups . Accordingly, this report sets out a Federal strategy for the next five years based on a Vision for a future where all Americans will have lifelong access to high-quality STEM education and the United States will be the global leader in STEM literacy, innovation, and employment. It represents an urgent call to action for a nationwide collaboration with learners, families, educators, communities, and employers—a “North Star” for the STEM community as it collectively charts a course for the Nation’s success.